There are a number of reasons behind the high street crisis. Our high streets have changed dramatically in the last ten years. Familiar favourites Woolworths, Blockbuster, BHS, Poundworld and Toys R Us are just some of the big names that have disappeared from our town centres completely. Even retail giants Debenhams and House of Fraser have had to shut stores. While Woolworths may not have managed its debts effectively, and Blockbuster failed to adapt to the changing market and rivalry from internet retailers, there are other very real and present challenges which are proving difficult for even the most established bricks-and-mortar retailers to navigate. A fall in discretionary spending: A fall in the pound has made imported goods more expensive, with some of those costs passed on to consumers. Add to that the uncertainty that Brexit is bringing to the mix and it’s no surprise that the high street is in trouble. Shift to online shopping: An increasing number of shoppers are choosing online shopping over going to the shops. The UK may have one of the highest e-commerce sales figures as a percentage of all retail sales when compared to other countries, but this figure is only 18 per cent. This means that 82 per cent of sales must still take place in our bricks-and-mortar stores, so the challenge for retailers then becomes how to make sure they take place in their stores. Rising overheads: Inflation is not the only cost pressure retailers are facing. The National Minimum Wage and new National Living Wage for over-25s increase every April, pushing up payroll costs at a time when it has never been tougher for retail. Despite these challenges, if bricks-and-mortar retailers are to survive, they need to keep shoppers coming back. But they need to attract them into store first. The online giants might deliver choice, convenience, and competitive pricing, but retailers are actually able to deliver these elements in a bricks-and-mortar store, all with the right technology. 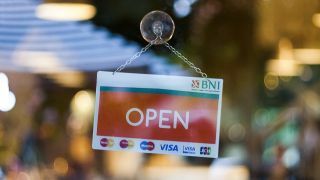 Often overlooked, but still an important asset for bricks-and-mortar retailers, is the point of sale (POS), which presents a significant opportunity to interact with customers and to deliver a more personalised experience. Data generated at the POS during the transaction process provides a wealth of information, enabling retailers to target customers with meaningful reasons to return through targeted and relevant offers. This more personalised approach can have a positive effect on building relationships and ultimately getting customers to return and spend more money. The POS can play an important role here when it comes to capturing data about shoppers’ purchase behaviour, but there are some key points to address in order to make this as successful as possible. It's important that retailers use all the tools at their disposal to work the bottom line as hard as possible. While it’s easy to identify customers online, it’s much harder for retailers to identify and engage customers in the physical store, and even more so if they don’t have a loyalty scheme. However, with software installed at the POS, it is possible to identify a customer from a transaction and then use analytics to effectively target them with meaningful reasons to come back in-store. The next steps are about getting the most out of those insights, ultimately driving increased sales and footfall. Focusing on the following five key areas is one way to ensure that this happens. Accurate and quality data about shoppers’ buying behaviour can inform offers, enabling retailers to deliver targeted promotions, messages and rewards based on previous shopping behaviour and purchase history. These offers can take the form of coupons or messages on till receipts or via digital media, which can include stretch spend offers, discounts on new or regularly-purchased items, promotions on complementary products, or value-added information like product care instructions. To maximise the ROI from their marketing campaigns, retailers need to ensure that the data they’re using is as up-to-date as possible. Historical data certainly plays a role in shaping campaigns and refining offerings, but it’s having access to the real-time element that sets successful retailers apart from their competitors. Gathering real-time data at the point of sale can help retailers engage customers with relevant, targeted offers and can be used to further influence wider marketing campaigns and boost long-term customer retention. When it comes to campaigns, there is often a time lapse between customer segmentation and campaign execution. What was relevant last month is perhaps no longer so. By using machine learning to automate the process, the delay between segmentation and delivery can be minimised. Combining automation with real-time data can help retailers improve their marketing efforts, particularly around trigger-based campaigns and promotions, increasing their chances of success. Measurement is crucial. Real-time data can be fed back to a retailer’s marketing team to give them an accurate and timely view of campaign activity – enabling them to make informed decisions throughout the campaign. So, if it isn’t delivering a return on investment, the sooner this is flagged, the sooner it can be stopped. The ability to connect with customers and deliver targeted, personalised rewards and offers is a key differentiator for retailers and provides a significant opportunity to revive the high street. If retailers adopt a targeted promotions strategy, they can more accurately measure the effect on sales revenue, and see the impact from the top line through to the bottom line. The high street is in for a rough ride. But those retailers that succeed will be those that get to know their customers, understand their behaviour and have the means in place to deliver relevant promotions that meet their needs. If retailers focus in on the point of sale, then they could potentially open up a data mine that could markedly boost their revenues.